We’ve all heard it. Maybe you’ve even been called it. The F Word. I’d like to think that there is a difference between frugal and cheap. However, popular nomenclature seems to want to treat these two words as synonyms. Case in point? This lovely open letter written by Giuliana Rancic’s husband to her. * The letter really is quite touching. He pays tribute to her strength and it’s quite easy to picture him beaming with pride as he writes. He also says the word frugal. Even though I think the word he’s looking for is cheap. Or maybe even rude. Granted, he does joke that Crate and Barrel will be sending him an ex post facto bill now that he’s revealed this sweet tale. But, seriously? Is this frugality? The towels will dry, after all. Or is using a product, putting it back on the shelf, and walking away something else entirely? I’d tend to go with the latter. But maybe that’s just me. *If you don’t know who Giuliana Rancic is, that’s OK. I spent fifteen minutes Googling her after this article started trending on Facebook, and I’m still not sure I really get the whole picture. 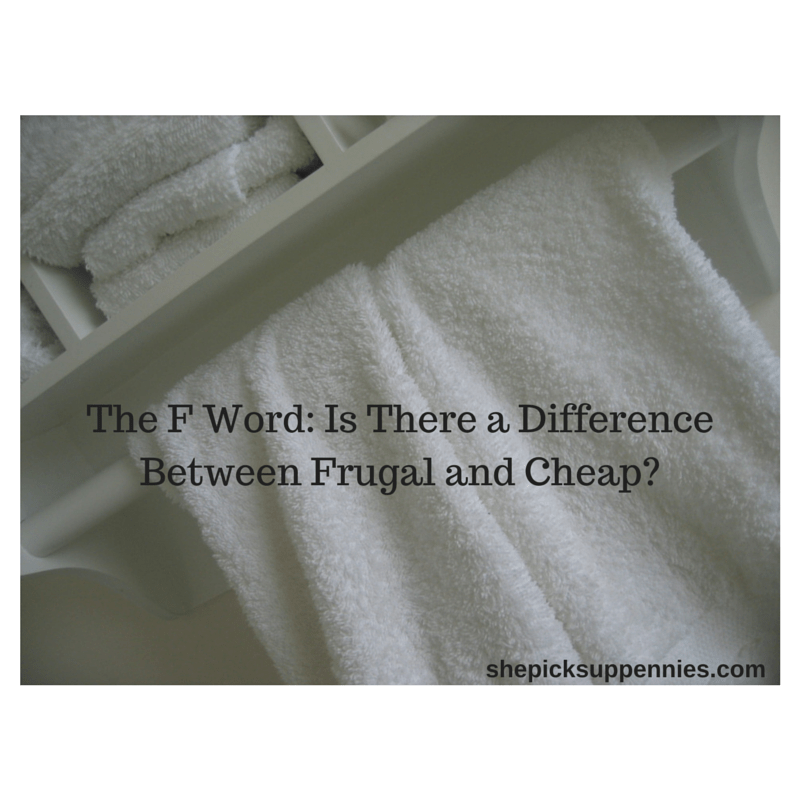 So Tell Me…Do you think there’s a difference between frugal and cheap? If so, have you ever crossed it? I’m so glad I’m not the only one who feels that way. My skin was crawling. At first, I thought, oh what a sweet memory. And then I read the fact that they used the towels and put them back and just shuddered! Have to come down in agreement with you, ladies. Frugal is making the most of your money. Cheap is using something that doesn’t belong to you. and foisting it off on an unsuspecting person. Yes. The unsuspecting part is the worst, I think! I agree. Frugal is being sensible. Careful with your money and not wasting money, but aldo willing to spend when you need to. Being cheap is where you refuse to spend money on things that are desperately needed even when you have that money available. I hope I’ve never gone to that extreme, but definitely been guilty of cheap! And yes definitely a difference! Thanks for another insightful post! I’ve been called cheap by many of my college friends. They didn’t understand why I still lived in my frat house basement ($425 a month FTW) after I got my first engineering job out of college. They didn’t understand why I drove a 15-year-old car until it died. They didn’t understand why I brought in lunch every day instead of spending $10 on somethinga fancy. They still don’t understand why I max out my 401k and Roth IRA. I’m definitely not cheap, if I want something, I generally buy it. I always leave at least a 20% tip at restaurants: I’d be extremely upset if a child didn’t get to eat dinner because I’m a snob and it took 2 minutes to get my sparkling water instead of 1. But am I frugal? I’m trying to get there. I definitely spend way too much money to be frugal. Right now I’m considering buying $100 rock climbing shoes, and shelling out $80 a month for a climbing gym membership. I could at least find a gently-used $30 pair on CraigsList. The difference between cheap and frugal is a mindset. Someone who is cheap won’t spend money because they value money. Someone who is frugal thinks about what value spending money will produce, and then makes a decision. Case in point: a cheap person will spend $50 on hiking boots, leave the tag on, and return them after their trip; a frugal person will research hiking boots, find the best value, pay $100, and use them for a lifetime. That’s a great way to put it, David. Sometimes I fall into the cheap category…like when I refuse to buy new shoes so long that I cause back pain. But I also try to be really mindful of how my money impacts other people. I can’t stand not tipping. I’d rather stay home and eat.